In recent decades, the competitive landscape in many markets (e.g., retailing) and the methods that researchers use to analyze these markets have changed heavily. This has resulted in updates of empirical generalizations in many areas. For cross-price elasticities, however, this update is pending. Hence, it is unclear how these changes have affected cross-price elasticities, a key measure of competitive interaction. To address this void, we conduct a meta-analysis of prior econometric estimates and consider a broad set of determinants that have not been analyzed before in the context of cross-price elasticities. Using 7,264 estimates from 115 studies, we identify six new main empirical generalizations. (1) The mean cross-price elasticity is .26 (median =.10), which is half the magnitude of the previous meta-analytic mean. (2) Cross-price elasticities have decreased over time, and (3) they decrease over the product life cycle. (4) High-stockpiling groceries have the highest cross-price elasticities. (5) Long-term cross-price elasticities are larger than short-term cross-price elasticities. (6) The asymmetric share effect only holds in high-share tiers. We derive implications based on these empirical generalizations. Mark Houston and John Hulland served as Special Issue Editors for this article. The online version of this article ( https://doi.org/10.1007/s11747-019-00642-0) contains supplementary material, which is available to authorized users. 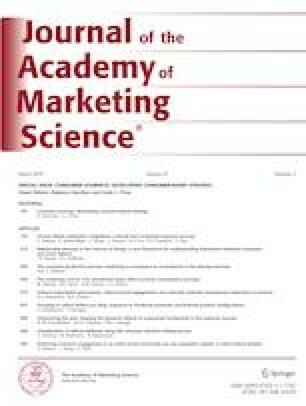 The authors thank Harald van Heerde and participants at the 2016 ISMS Marketing Science Conference in Shanghai, and participants at the 2017 Annual Conference of the European Marketing Academy in Groningen for valuable comments. The authors gratefully acknowledge the helpful and constructive input by the editors, the AE and two anonymous reviewers.